Lifelike, Natural-Acting and Natural-Feeling Tooth Replacement Options! A dental implant is a small titanium post that functions as a missing tooth root. An implant fuses with your jaw to become a stable foundation for a new tooth. Implants can be topped with crowns, or they can be used to support an implant-supported bridge or denture. When teeth are missing, the jaw surrounding the area loses vital stimulation normally brought about by the actions of chewing and biting. This lack of stimulation causes the bone to diminish in volume over time. This situation can be made even worse through the wearing of traditional dentures, which rub against and irritate the dental arch, accelerating bone loss. Dental implants provide the necessary stimulation to prevent further bone loss while providing a high degree of chewing power. 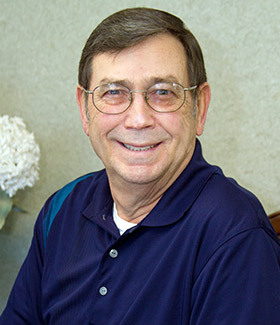 In the past, certain patients were not considered to be good candidates for dental implants. Patients with diabetes, excessive loss of bone in the jaw, or unhealthy habits such as smoking were not able to enjoy the benefits of implants. Due to continuing advancements in implant placement techniques, and improved bone grafting materials and procedures, almost any patient can now receive implants, even those with formerly prohibitive health conditions. 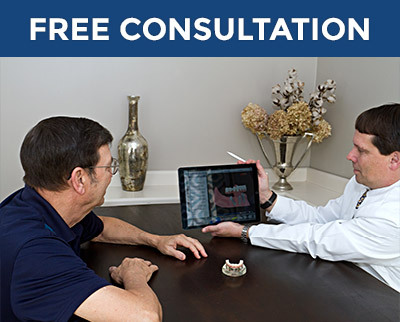 Dr. Field can examine you and let you know whether implants would be an option for you. Titanium is a noncorrosive, biocompatible material that has the capability of fully integrating (fusing) with human bone. 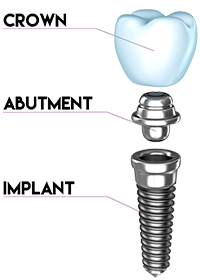 It has been used medically since the 1950s and has been proven safe and effective.Titanium implants are strong and durable, and with proper care, they can last you for the rest of your life. Implant-supported replacement teeth function just like natural teeth, allowing patients to regain 70 to 90 percent of full chewing power, so they are able to eat the foods they like. Implants are so lifelike that patients say they cannot tell the difference between their implants and their own natural teeth. They can even be cared for like natural teeth, with brushing and flossing and regular dental cleanings. Bone loss occurs when tooth roots are missing and are not replaced. When a tooth is missing, the underlying bone in the jaw can deteriorate due to lack of stimulation normally brought about by chewing and biting. In the first year after a tooth has been lost, bone volume can be reduced by as much as 25 to 30 percent in the area of the missing tooth, and will continue unless an implant is placed. Dentures worsen the situation. As the jawbone deteriorates, dentures will begin to lose their snug fit and become loose, slipping around in the mouth. Dentures rub against the gummy arch holding them in place, causing irritation and further loss of bone. Implants provide healthy stimulation of the jaw and help prevent bone loss. They provide the same stability and function as natural, healthy teeth. When a tooth is missing, the adjacent teeth become destabilized and can start to shift toward the gap. As the shifting teeth change position, your bite can be affected adversely, possibly leading to difficulties with chewing or TMJ issues. Dental implants fill the gap, stabilizing the jaw and preventing neighboring teeth from shifting. 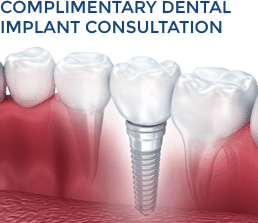 With dental implants your bite and teeth alignment are preserved. Dental implants help maintain the structure of the jaw by preventing bone loss. Without implants, patients who have many or all of their teeth missing will experience progressive bone loss in their jaw. As a result, the height between the tip of the nose and the chin will decrease, causing the lower third of the face to get a “collapsed” look. Undesirable consequences include sagging, wrinkled skin, thinner lips and a pointier chin, all of which make a patient look much older. Dental implants are a far superior solution for missing teeth, as compared to dentures. Dentures are unstable and even though they fit well at first, they will lose their fit over time due to continuing bone loss. Dentures slip and rub against the bony ridge, contributing to soreness and swelling of the gums. As time goes by, the bony ridge that supports the dentures wears away, making for even less stability. Perhaps worst of all, dentures offer only about 10 percent of normal chewing power and turn eating into a chore instead of a pleasure. 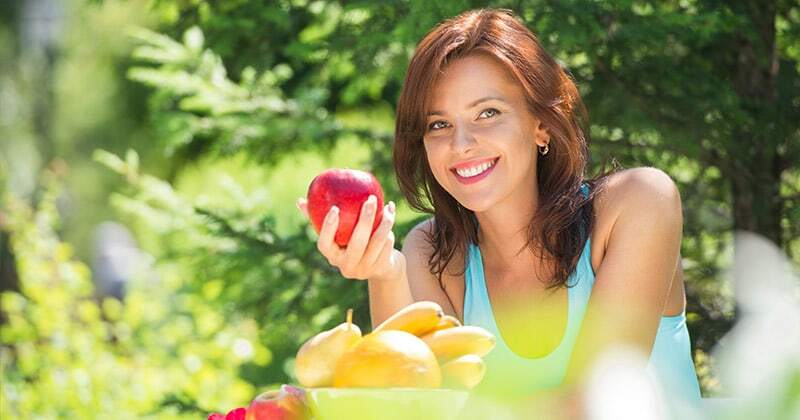 Dental implants provide you with nearly full chewing power! If you are trying to decide between implant-supported new teeth or traditional dentures, here are some important things to consider. Dentures can slip out while eating or speaking. Implants are completely fixed and stable and won’t move around. With dentures, chewing is difficult and food choices are limited. 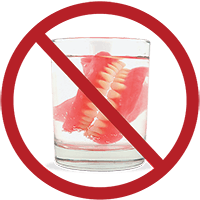 Dentures offer only 10 percent of natural chewing force and are unstable, so eating with dentures takes much longer and makes certain foods off-limits. Replacement teeth supported by dental implants provide excellent chewing power. Dentures often need to be held in place using dental adhesive. Dentures cover the roof of your mouth. Implants are free of the fake palates that hinder your sense of taste and your ability to speak normally. Dentures have to be removed for cleaning. Implants are cared for by brushing and flossing, just like natural teeth. Dentures don’t provide the stimulation needed to help prevent bone loss. Normal chewing and biting pressure helps stimulate the jaw and contributes to healthy regeneration of bone. Dentures fail to provide stimulation and actually spur bone loss. Progressive bone loss brought about by dentures can cause facial collapse. As the years go by, bone loss in the jaw can cause the lower third of your face to take on a shrunken, aged look. Excessive wrinkles, sagging cheeks and skin, thinned lips and a pointy chin can considerably change your looks and make you appear much older than you are. Implants help preserve your facial structure and attractiveness. A dental bridge consists of a series of connected crowns to replace one or two missing teeth. The bridge is supported by the teeth adjacent to the gap. 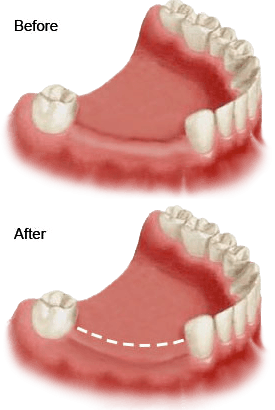 With a traditional bridge the adjacent teeth, even if they are healthy, need to be trimmed down and covered with crowns to support the bridge. 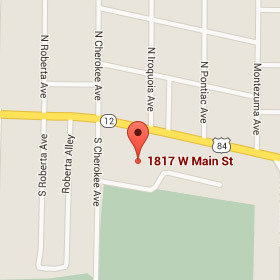 This is not ideal, as we always strive to preserve healthy teeth. With an implant, no additional support is needed and adjacent teeth are not compromised. Bridges last from five to ten years, whereas dental implants can last a lifetime. Traditional bridges may offer a more economical option initially, but in the long run a dental implant can cost less and eliminate the need for additional dental work.